What the New York Times' Nazi story left out. The history of America has been written by normal white racists living in normal towns. 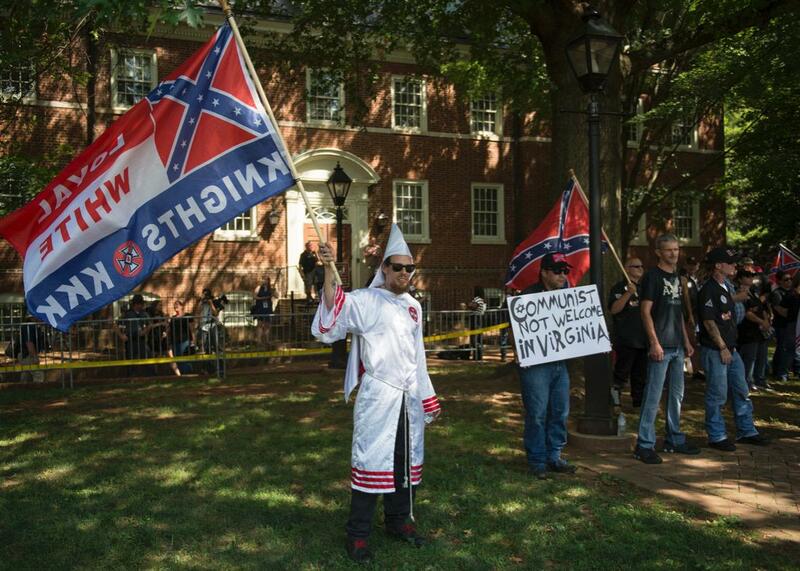 Members of the Ku Klux Klan at a rally in Charlottesville, Virginia, on July 8. The conceit of “A Voice of Hate in America’s Heartland,” the New York Times’ profile of Tony Hovater—a neo-Nazi who helped start the Traditionalist Worker Party, a white nationalist group—is that there’s something incongruent in Hovater’s ordinary Midwestern life and his virulently racist and anti-Semitic beliefs. “Why did this man—intelligent, socially adroit and raised middle class amid the relatively well-integrated environments of United States military bases—gravitate toward the furthest extremes of American political discourse?” asks the writer, Richard Fausset, in a subsequent piece explaining the editorial decisions behind the story and reflecting on his conversations with Hovater. Hovater’s extremism may demand some additional explanation, but there’s nothing novel about virulent white racism existing in banal environments. That, in fact, is what it means to live in a society structured by racism and racist attitudes. The sensational nature of Hovater’s identification with Nazi Germany obscures the ordinariness of his racism. White supremacy is a hegemonic ideology in the United States. It exists everywhere, in varying forms, ranging from passive beliefs in black racial inferiority to the extremist ideology we see in groups like the League of the South. A look back to the past is instructive. In 1921, one of the deadliest anti-black riots in American history occurred in Tulsa, Oklahoma. A mob of white men, eager for retribution after the alleged assault of a young white woman, descended on the city’s prosperous Greenwood neighborhood, dubbed the “Black Wall Street” by admirers. Armed with pistols, rifles, and a machine gun—as well as a plane equipped with rudimentary bombs—this makeshift army burned Greenwood to the ground, killing hundreds in the process. We don’t know who gave order to the mob, organizing and amplifying its lethality, but we can identify the men who participated. They weren’t, as white Tulsans would later learn, the working-class men drawn to the city’s oil wealth and frontier atmosphere. No, they were Tulsa’s white elite—its respectable middle class. “Photographs of the tragedy also showed that many in the white mob drove the most expensive cars and dressed in clothes beyond the means of the average roughneck,” notes Tim Madigan in The Burning: Massacre, Destruction, and the Tulsa Race Riot of 1921. They were recognizable. Ordinary. The same was true of the anti-black mob that destroyed parts of Knoxville, Tennessee, in 1919. It was true of the one that lynched Rob Edwards in Forsyth County, Georgia, in 1911, and later drove the blacks of Forsyth out of the county. From the Ku Klux Klan of the Reconstruction South to the White Citizens Councils of the Jim Crow South, ordinary men and women have always been enforcers for the racial order. Likewise, those seemingly ordinary environments are themselves part of the story of American racism. As James Loewen describes in Sundown Towns: A Hidden Dimension of American Racism, the human landscape of the Midwest was shaped by rigid segregation. “Beginning in about 1890 and continuing until 1968, white Americans established thousands of towns across the United States for whites only. Many towns drove out their black populations, then posted sundown signs. Other towns passed ordinances barring African Americans after dark or prohibiting them from owning or renting property; still others established such policies by informal means, harassing and even killing those who violated the rule.” Hovater’s home, Huber Heights, Ohio, was one of those places. Virulent racism doesn’t just exist in seemingly banal environments; virulent racism has shaped their very existence. If the focus on Hovater’s mundane life paints an inaccurate picture of racist ideology as abnormal, then the larger decision to profile a neo-Nazi further obscures the forces driving our politics at this moment. Even with their greater visibility in public life, extremist racists like Hovater remain fringe figures who can make a splash in the media—and provoke violence—but do little else. By contrast, more “moderate” forms of white racism—the everyday, ordinary varieties that rarely elicit protest outside of public forums—are politically powerful. They are what had a profound influence on the 2016 election, what President Trump stokes and feeds on when he tweets against black athletes and celebrities, and what shape some of the limits of the possible in our politics. Someone like Hovater might have a relatively high profile, but what’s fueling the return of explicit racism to our politics is something appropriately banal and, yes, ordinary.